Gold and silver futures declined for a second straight session Friday. The loss for gold snatched away its weekly gain. Silver, however, still advanced on the week — its third straight weekly increase. Gold for June delivery declined $10.50, or 0.8%, to settle at $1,338.30 an ounce on the Comex division of the New York Mercantile Exchange. "Sixteen market professionals took part in the survey. Seven respondents, or 44%, called for gold prices to rise over the next week. Another six voters, or 38%, looked for gold to fall, while three, or 19%, called for a sideways market. Meanwhile, 677 voters responded in an online Main Street survey. A total of 463 respondents, or 68%, predicted that gold prices would be higher in a week. Another 145 voters, or 21%, said gold will fall, while 69, or 10%, see a sideways market." Elsewhere, silver for May delivery lost 7.6 cents, or 0.4%, to finish at $17.163 an ounce. Silver futures jumped 3% this week after rising 1.8% last week and climbing 0.6% the week before then. On Wednesday, they settled at $17.248 an ounce for their best close since Jan. 26. Silver is a modest 0.1% higher on the year to date. July platinum declined $8.30, or 0.9%, to $931.80 an ounce, for a 0.1% weekly loss. Palladium for June delivery added $3.75, or 0.4%, to $1,030.20 an ounce, for a 5% weekly increase. The two metals remain lower on the year with losses of 0.7% for platinum and 2.9% for palladium. Gold declined $11.85, or 0.9%, to $1,336.75 an ounce. Silver lost 8.5 cents, or 0.5%, to $17.11 an ounce. Platinum fell $10, or 1.1%, to $933 an ounce. Palladium shed $5, or 0.5%, to $1,031 an ounce. In weekly LBMA results, advances included 3.7% for silver, 0.4% for platinum and 4.6% for palladium. Gold declined 0.5%. 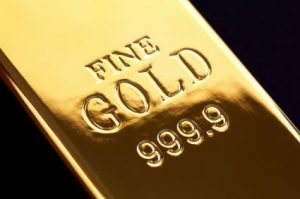 Gold bullion coins rose by 1,000 ounces after rising by 2,500 ounce last week. Splits included 500 ounces in American Gold Eagles against 2,000 ounces previously and 500 ounces in American Gold Buffalos to match last week. American Silver Eagles advanced by 275,500 coins this week after they climbed by 125,000 coins last week. On Monday, the U.S. Mint released its second 2018-dated 5-ounce bullion silver coin. The piece depicts Apostle Islands National Lakeshore in Wisconsin and it registered first-week sales of 30,000 coins or 150,000 ounces. No 5-ounce coins sold last week.